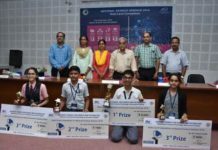 Ahmedabad: EMPRESARIO, the annual flagship event at Entrepreneurship Development Institute of India (EDII) kicked off on March 9 at EDII Ahmedabad campus. The event is organised by the EDII every year, and is an exclusive, one-stop platform for start-ups, new-age entrepreneurs, industry mentors, investors and students to dish out their entrepreneurial endeavours and experiences, gain new insights and pledge to become an invaluable part of the ever-flourishing start-up ecosystem in India. Over 400 students and budding entrepreneurs will participate over two days in brain storming sessions on entrepreneurs. 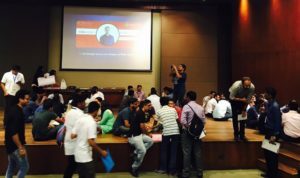 About 150 start-ups will share their business ideas, which will be evaluated by experts, entrepreneurs, angel investors and faculty of EDII. The two-day event was inaugurated amid fervour and enthusiasm by Mr. Dinesh Yadav, CEO, Arvind Accel Limited. EMPRESARIO was first launched in 2012 and has since then went on to emerge as one of the largest entrepreneurship fests celebrated in India. Held over two days every February, the fest witnesses thousands of participants from every part of the country. The focus this year is on fostering the start-up ecosystem of Gujarat as well as India. This will be brought into action by supporting and collaborating with ideas and start-ups of high-performing businesses, foundations, investors and individuals who are delivering solutions with market-oriented approaches for global development. The event will help start-ups turn their ideas into viable businesses. The theme of this year is Escalating Growth of Start-up Ecosystem while the sectors in focus are healthcare, artificial intelligence, IoT, augmented reality, virtual reality, food & water, education, MSMEs, fintech, manufacturing, e-commerce, travel & tourism, on-demand services, agribusiness, waste-tech & renewable energy, analytics & big data, Software as a Service (SaaS) and security marketplace. Mr. Yadav added that more start-ups should focus on healthcare, food, solid waste management and environment. Encouraging more youngsters to take up entrepreneurship, he added that an entrepreneur has access to a vast set of resources, has network and can be a job creator. All of this helps one to not only achieve own objectives but also meet the needs of the society. EMPRESARIO will create value among all those who are associated with the start-up ecosystem directly or indirectly. This time the focus will be to provide ‘Prototype Funding’ to 25+ start-ups through EDII’s partnership and to make funds available to these early and growth-stage start-ups through the institute’s network of venture capitalists.